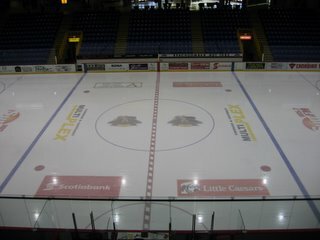 Bulldogs Game Day #50 in Surrey vs Eagles. Greetings from Langley. 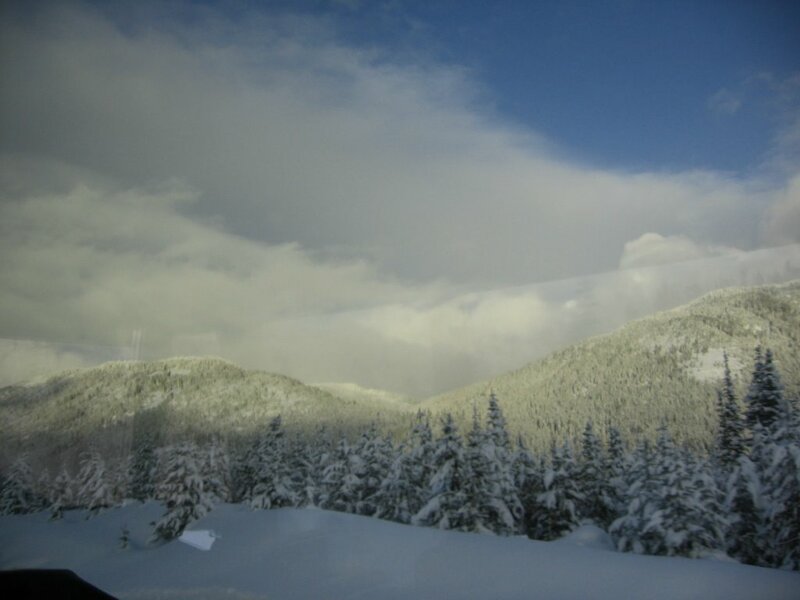 Just pulled in after the drive from Merritt. 2:54am as I check the scores from around the league and throw the broadcast together for tomorrow. Well, the streak is finally over. Like some, I wish it would've went on forever as it was a pretty fun ride. However, it's good that it's done as it reminds the players that they can lose, and what losing feels like. Should be a good one today in Surrey as the Bulldogs look to bounce back and start another streak. Lets not forget that after the last Bulldogs loss, which snapped an 8 game winning streak, they came back out and won 20 in row. Not to say that will happen again, but who would've said it would happen in the first place? I'm out to bed, but as promised here's pictures of the "IceBox" in Merritt, and the OT celebration in Vernon. Note the "obstructed view" out of the pressbox, haha. 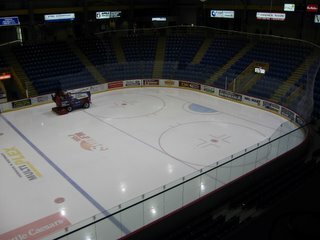 Pregame show from South Surrey Arena is at 4:45 on 93.3 The Peak FM, puck drop is 5:oo. Former Bulldog captain Ryan Storey is our second period feature interview. 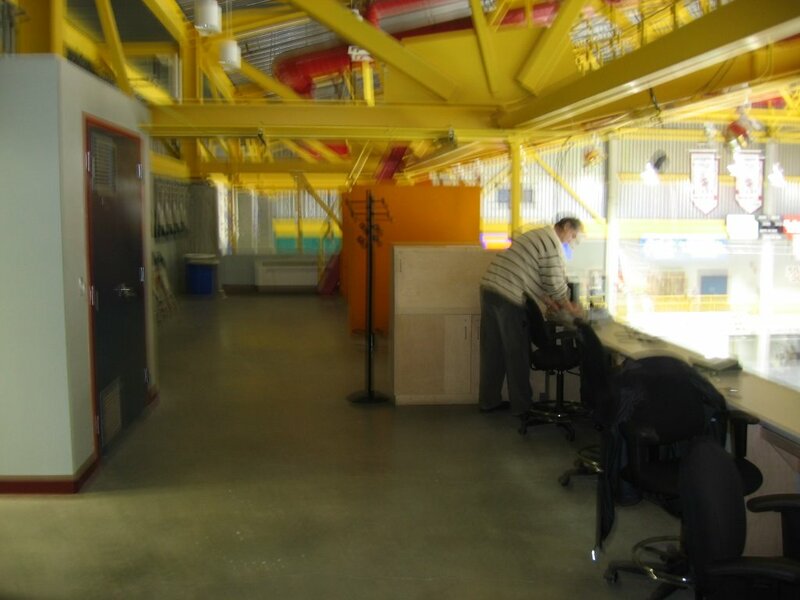 Out of The Peak's listening area, catch the internet broadcast through the BCHL's Fanzone. Send an email to the PRESSBOX. Bulldogs Game Day #49 in Merritt vs Centennials. Greetings and thanks for stopping by the blog. Running short on time being in the pressbox in Merritt getting everything ready for the broadcast. 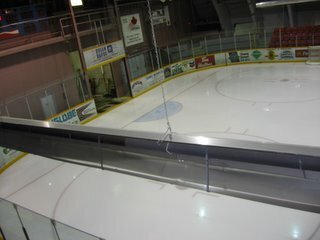 I have just taken pictures of the "Ice Box" here in Merritt and the view we have out of the pressbox. I will post them after I get to a high speed internet connection. If I have the jam after the Bulldogs get to Langley at around 3am tomorrow, I will post them then. For now, here's the post for the blog I wrote on the bus from Vernon to Merritt today. The Bulldogs go for their 21st win in a row tonight as they play the last team they have yet to see this BCHL season, after a come from behind, 3-2 double overtime win over the Vipers last night in Vernon. The Bulldogs started strong but as the first and second period wore on they weren’t in the game at all as the Vipers scored two second period goals to lead 2-0 heading into the third. In the third period the Vipers had a two man advantage with a chance to put the game out of reach. The Vipers called time out to talk it over realizing the importance of the powerplay. The Bulldogs realized the importance of the penalty kill, and killing the 5 on 3 might’ve been the momentum boost the Bulldogs finally needed to get in the game as just a minute after the two man advantage elapsed Kevin Noble drew a penalty that would prove to be crucial. The bright lights on the evening, Michalchuk, Ella, and Zolnierczyk were rewarded with their efforts on the man advantage as all three players had a whack at a loose puck before Evan Michalchuk would beat Viper goalie John Oltuis to get the Dogs on the board with just over 11 minutes left in the third. Just two minutes later Andrew Estey was credited with an odd re-direction goal and all of a sudden the game was tied 2-2. 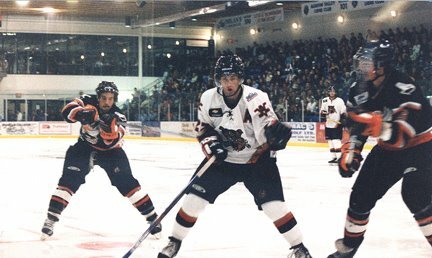 Neither team could score on several chances through the remainder of the third period, or the first overtime, until Jordan Kremyr scored by sneaking by the Viper centreman off a face off and beat John Oltuis as the Dogs pulled one out of the fire that they certainly didn’t deserve after two periods for their 20th win in a row. The Merritt Centennials took on the Vee’s in Penticton last night as both teams entered the third period tied 0-0. Just 2:30 into the third the Vees finally hit the scoreboard beating Brad McInnis to make it 1-0 Penticton. 1:30 later BCHL leading scorer Brandon Wong tied the game 1-1. 1:13 later Brody Mott gave the centennials their first lead of the hockey game, 2-1. With 10 minutes to go in regulation Evan Trupp tied the game 2-2, on the powerplay. 4 on 4, and 3 on 3 overtime couldn’t find a winner, as the teams played to a 2-2 draw. Another two big points up for grab tonight as the Bulldogs look for their 21st win in a row to hold onto their lead over the Nanaimo Clippers for first on the Island, and first overall. The Cents are 4-0-1-and 2 in their last seven games, and haven’t lost in regulation in 8 games since dropping a 3-0 decision in Penticton January 6th. Tonights second intermission feature guest is Roy Henderson, president of Global Sports Scouting Services and the Global Sports Camp. The 93.3 The Peak FM pregame show is on the air at 7:15, and the play by play is at 7:30 from the "Ice Box"
Bulldogs Game Day #48 in Vernon vs Vipers. 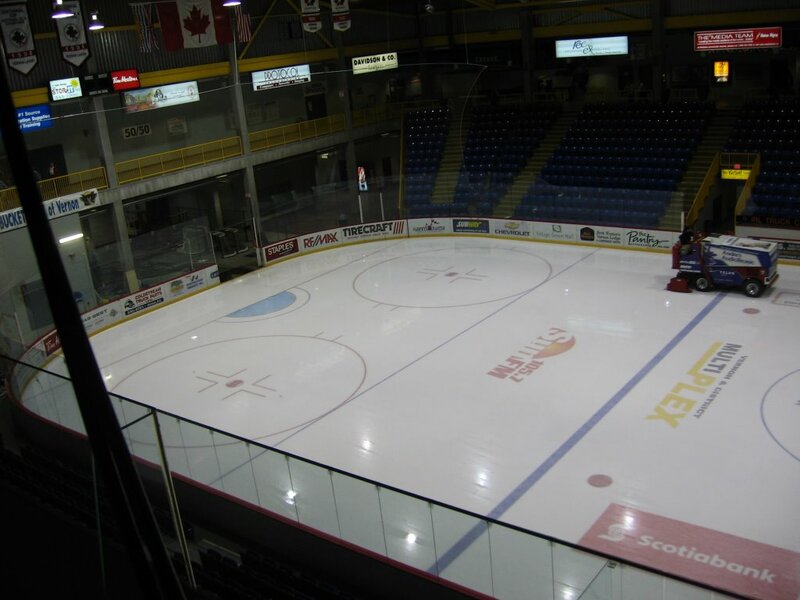 The Bulldogs go for their 20th win in a row tonight as they visit the Vipers in Vernon's Multiplex. The Vipers are 4 and 2 in 2006, and look for their second win in a row. 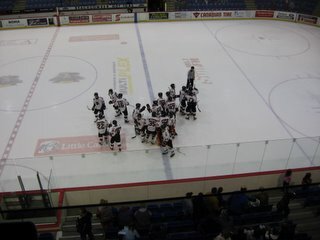 The Vipers are coming off of a 5-3 win in Langley Saturday night. The Bulldogs last saw action Sunday afternoon, beating the Salmon Arm Silverbacks 3-1. 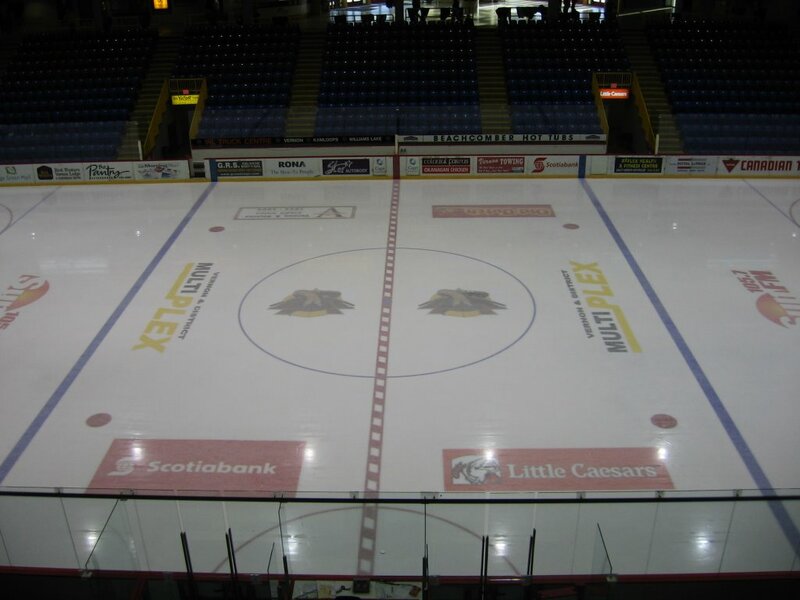 It's the first road game tonight for the Bulldogs since December 30th in Powell River. The pregame show on 93.3 The Peak FM is on the air at 6:45, the puck drop is 7:00. Our second intermission "feature guest" is Merritt Centennials Play-by-Play voice and marketer, Keegan Goodrich. Hello and thanks for stopping by the blog. Greetings from the road. Todays post comes from my good friend "JB" the colour commentator for home games on Chilliwack Chief broadcasts. 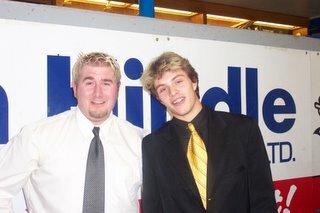 Anyone who has listened to Bulldogs broadcasts this year or last, or last years "BCHL This Week" show will remember JB. Great hockey guy, encyclopedia of BCHL and hockey knowledge. 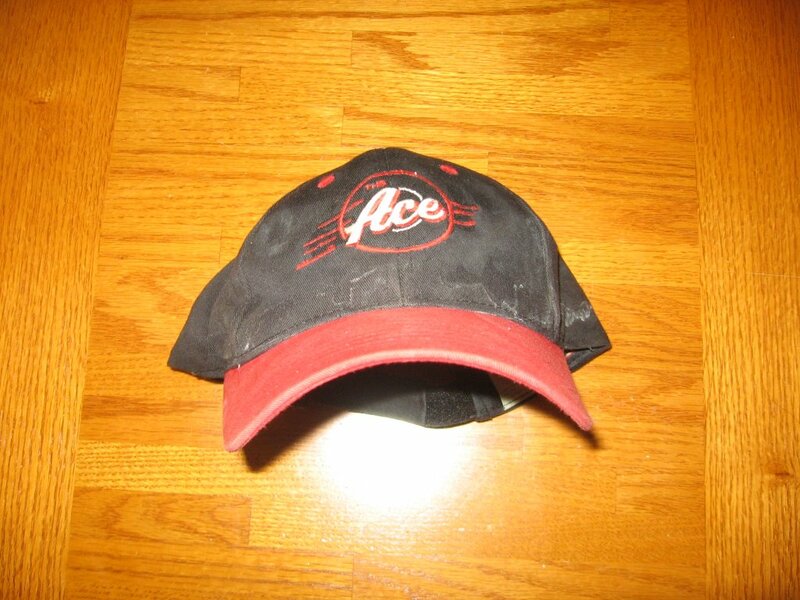 Even deserving of THE ACE hat. JB, I talked to Ace, the hat will be delivered to you GAME 60 when the Bulldogs visit the Chiefs. Ace told me to pass along that info and I told him you were inquiring. Back to the goal. JB emailed me a link to watch Kyle Mackinnon's amazing overtime winner against Langley, Friday January 13th. It sure wasn't an unlucky night for Kyle Mackinnon, as you'll see it's one for everyone's top 10 hilight reel. The fact that it was the overtime winner makes it pretty hard to beat. Maybe playoff winner or championship or series clincher? Ok, now that I've certainly built it up enough, lets get to it. And I'm sure Colin "techie" was on the cameras but JB didn't mention. Game day comments coming if I can manage it tomorrow from Vernon. Great BCHL stats from 1961 with Ace, heading on the road. Hello and thanks for stopping by the blog. Making last post before heading on the road tomorrow. Above is a picture of my Ace hat I took. "The Ace" Alf Thompson is the colour analyst on 93.3 The Peak's Bulldogs broadcasts, my partner in crime, and he's also among other things. A very smart and historical hockey man and past coach, and BCHL walking record book, among others. He has hats like the one shown above, that he gives to people. 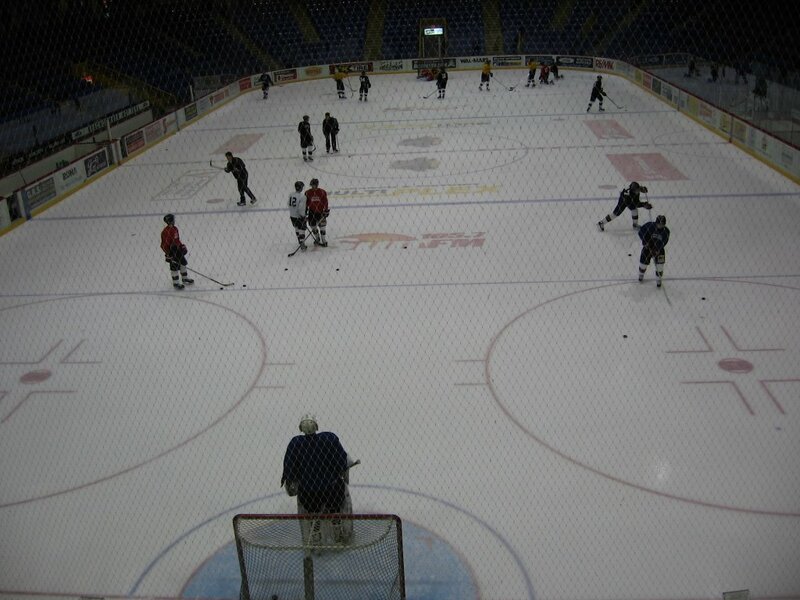 People that in any way, shape, or form, have had a part of the Bulldogs hockey,or the minor hockey in the area. From players to coaches to play by play guys to fans to volunteers to trainers, and their assistants and booster club members and transportation people and more. It's been an honor to some people and a shock to others and players have been known to score a couple goals or have a great game the night they get it. Because other guys have them, but not everyone, haha. Some guys wear them only at the rink getting ready on game day, some people wear them everywhere. I wear mine to work on occasion, and have worn it golfing. I respect Ace like I respect anyone else in the BCHL that is a part of some broadcast crew somewhere, somehow, in whatever medium. It's not an easy job and not anyone can do it. It's entertaining to watch Ace try to will players with his mind, what he's anticipating the best play to make at the right time. Also entertaining is the emotion he shows when the particular play unfolds one of two ways, good or bad. Since 1961/62 the Interior Division has won the B.C.H.L. Playoff Championship 26 out of 44 times = 59% of the time. The Mainland division has won the B.C.H.L. Playoff Championship 12 out of 44 times = 27% of the time. The Island Division has won the B.C.H.L. Playoff Championship 6 out of 44 times = 14% of the time. The Interior Division has won both the league and playoff championship 16 of those 24 times = 66% of the time. The Island Division has won both the league and the B.C.H.L. playoff championship just 4 times in 44 years = 9% of the time. Those teams were the 1968/69 Victoria Cougar’s and the Nanaimo Clippers (three years in a row) between 1975/78. If the Bulldogs or any other Island team were to win both the league and B.C.H.L. playoff championship combined, it would be the first time in 27 years to be done. 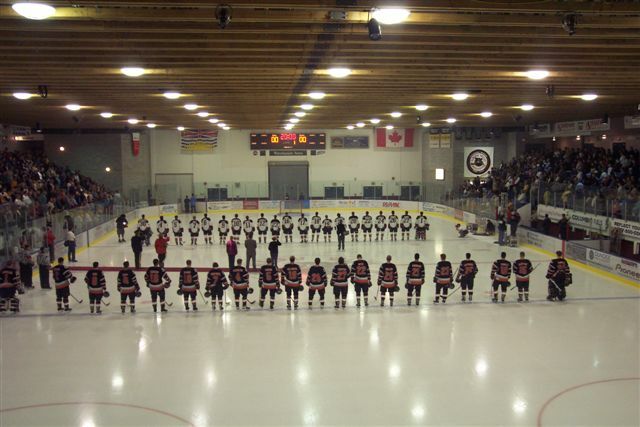 The Victoria Salsa 2000/01 and the Nanaimo Clippers of 2003/04 won the B.C.H.L. playoff championship but neither of those two teams won the overall regular season league title. Thanks Ace for the stats. The Dogs are in Vernon Friday. 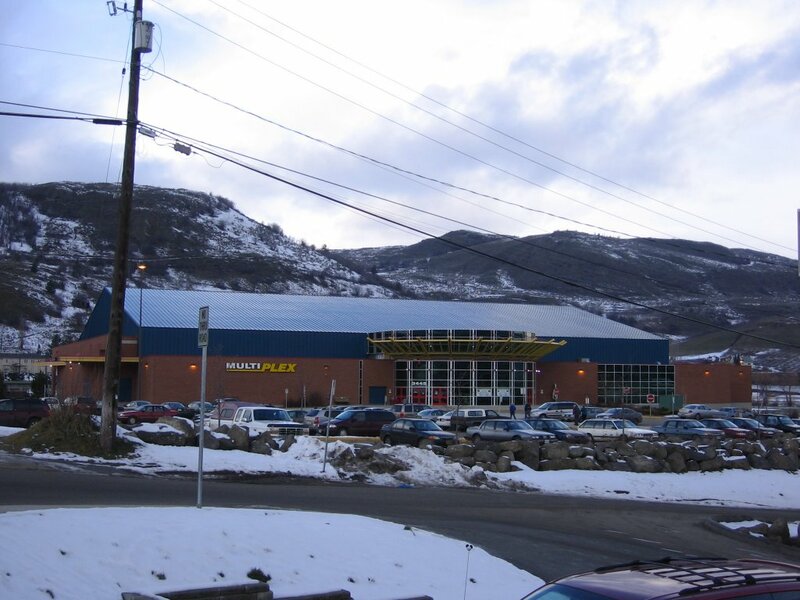 The 93.3The Peak pregame show begins at 6:45, and the puck drop is at 7:00 from the Vernon Multiplex. Our second intermission "feature guest" is Keegan Goodrich, Play by Play voice and marketer of the Merritt Centennials. 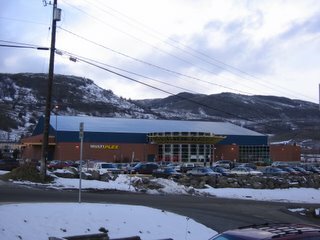 Saturday from the Nicola Valley Memorial Arena, pregame show begins at 7:15 on 93.3 The Peak FM, with the puck drop at 7:30. 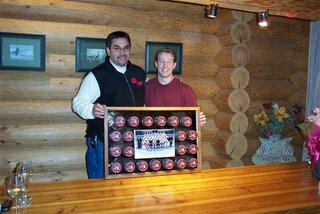 Our second intermission "feature guest" is Roy Henderson, president of Global Sports Scouting Services Inc, hosters of the Global Sports Camp Many hockey players further their careers going through there. Current and former Bulldog players- Nenad Gajic, Brian Stewart, Joe Scali, Jordan Kremyr, Tyler Ruel, Devin Timbelake, Aaron Blocklehurst, and more, if I'm correct. Interesting to hear Roy talk about priorities like hockey, school, and family and what order they should be in. 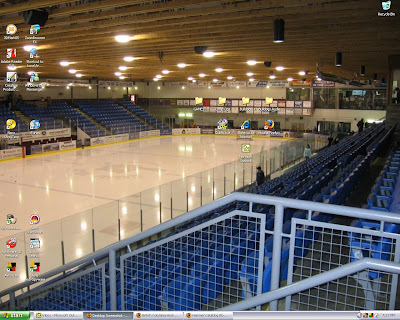 Sunday's 93.3 The Peak FM pregame show is at 4:45pm from the South Surrey Arena, and the puck drop is a 5pm. Our second intermission feature guest is former Bulldog player, and captain, Ryan Storey. My thanks to Jamie Amos for getting me in touch with Ryan for the alumni interview! Thanks Jay Mo. 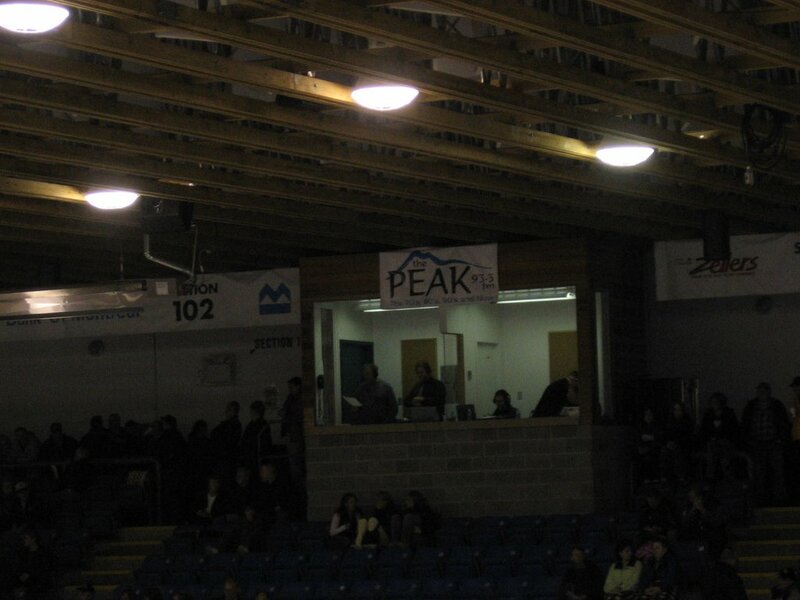 Out of The Peak's broadcast range, catch the game on the BCHL's Fanzone. I WILL update in some shape or form, while on the road. Hello and thanks for stopping by the blog, and once again thanks BIG DOG for the great picture. Great emotion showed there on the overtime game winner Saturday night. Todays posting is a podcast of my "rant" on the CJAHL Top 15 Rankings originally broadcasted this morning on the morning show on 93.3 The Peak FM. Click HERE to listen to MY Rant. Enjoy, and please, share your comments as always. Also, I keep throwing this out there- if you have any Bulldogs game pictures, fan pictures, player pictures, BCHL pictures, etc PLEASE send them and I'll use them here on the blog and I'll give you credit. Click HERE to email me. Once again, please don't hesitate to send your post requests- audio or otherwise, ideas, complaints, questions, etc etc. Bulldogs 3 Silverbacks 1 for 19 in a row. 93.3 THE PEAK's Bulldogs broadcast hilights. Hilight Reels on the way today! After my duties are done at the station today, I will be posting the hilight reels from the 18th and 19th wins in a row for the Dogs over Nanaimo Saturday and Salmon Arm Sunday. Be sure to check back! The Bulldogs go for their 19th win in a row today as they host the last team that beat them, the Salmon Arm Silverbacks. 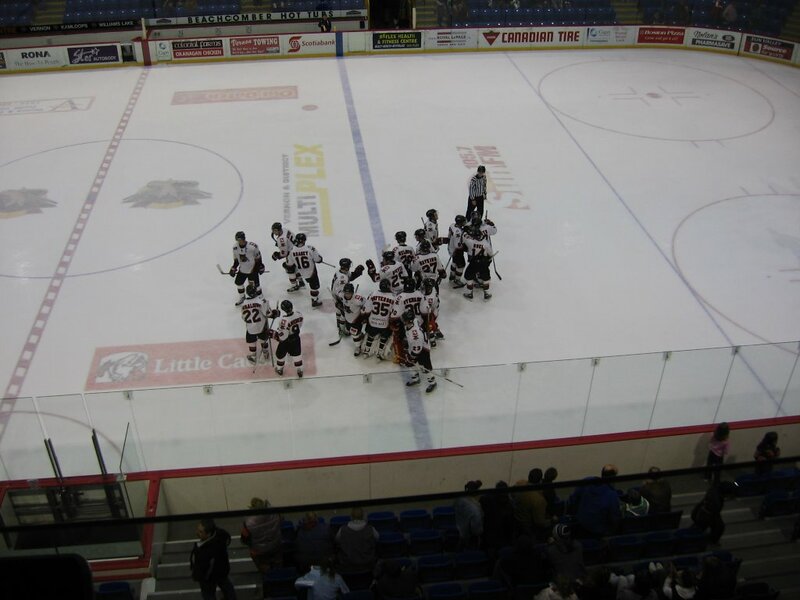 The Bulldogs 18th win in a row was an exciting one last night, as they beat the Nanaimo Clippers 4-3 in overtime, their fourth consecutive win over the Clippers. As I posted on the Bulldogs-Clippers game day thread in recap, the game wasn't without controversy as the Clippers tied the game in the final minute of the third period, with Brian Stewart taken out of the play as the shot arrived. Justice was served in overtime though, as Andrew Ella scored the biggest goal of his career coming down the right wing and blowing a slapshot past Simon Leblanc who was good in the Clippers goal. Brian Stewart was again the games first star playing fantastic from start to finish. I haven't seen Stewart as animated as he was last night after the game tying goal, all season long. Credit to him to get his focus quickly back for overtime. With the two points garnered from the win, and the 1 point the Clippers earned with the OT loss, the Bulldogs lead the Clippers by 10 points for first on the Island, and first overall. Back to today- as I said off the top the Bulldogs play the team that last beat them, the Salmon Arm Silverbacks. The Bulldogs went into Salmon Arm Sunday, November 20th, for their third game in two and a half days, while riding an 8 game winning streak. The Bulldogs started the game very solid, but couldn't hit the scoresheet. The game was much like last years contest in Salmon Arm, where the Bulldogs didn't look awful, but the score sure did. The Silverbacks scored two powerplay goals in the last five minutes of the first, and two more powerplay goals in the first seven minutes of the second to pretty much put it out of reach. The Bulldogs got on the board with 4:43 left in the second and looked to maybe have a fighting chance, but with less than a minute left in the second the Backs scored their first even strength goal of the game to lead 5-1 heading into the third. The only other goal of the game was another powerplay, the 'Backs 5th of the night, for the 6-1 final. If there's one thing I hope the Dogs took out of that game, it's that you can't give the 'Backs vaunted powerplay too many chances, or they'll hurt you in a big way. After that loss, and the ending of the 8 game winning streak, I'm sure we were all wondering what was to come from the Dogs as a bounce back. NO ONE saw an 18 game winning streak, and don't try to tell me for one second you did, haha. I guess things are now even today. 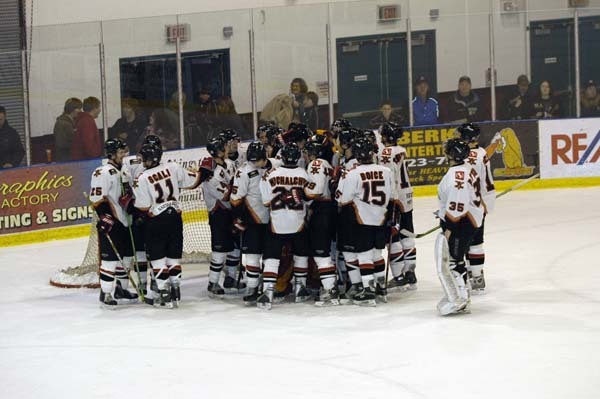 The Silverbacks got the Bulldogs at the end of a three game, two and a half day roadtrip. Not an EXCUSE, but certainly a FACTOR. Now the Bulldogs host the Silverbacks today in the same situation, their third game in two and a half days. The 'Backs have earned two points on their trip so far, after a ugly ugly 10-3 loss in Nanaimo Friday, the 'Backs beat Cowichan 5-4 last night in Cam Macintyre's return to Duncan. Catch the 93.3 The Peak pregame show this afternoon at 2:45 with Ace and myself. The play-by-play begins at 3:00. Thanks for stopping by the blog and keep sending your requests, comments, complaints, suggestions, pictures, etc, and don't forget to post your game comments. 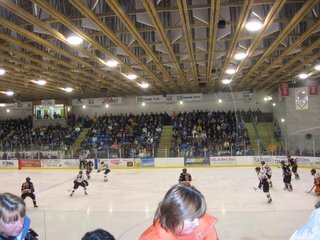 Just got back from the Mulitplex from taking in one of the games of the Alberni Valley Minor Hockey Associations 42nd annual Jamboree Weekend. Pee Wee Rep Timbermen over Kerry Park 4-3, in come back fashion with the winner coming with just over a minute to play. Good job Timbermen! Last night, instead of heading to Nanaimo to see the Clippers-Silverbacks matchup, I decided I'd enjoy my rare friday night off. How did I enjoy it? My girlfriend Sarah and I went down to the rink anyway (haha) to catch part of the Jamboree skill competition. Kudos to the Bulldogs players for being involved out there on the ice with the minor hockey players, it must be a thrill for the kids. Huge game tonight at the "sold right out" (so I hear) DAWG POUND as the Bulldogs look for their fourth straight win against the Clippers. The Bulldogs look for their 18th win in a row, the Clippers look for their third win in a row after tuning up the Salmon Arm Silverbacks 10-3 last night. Prior to that game, the Clippers last played last Sunday, beating Williams Lake 11-1. Flashback time. Heres the end of the game play by play from the 93.3ThePeak Bulldogs's broadcast from the last time the Bulldogs and Clippers played. 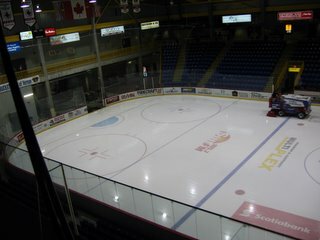 The Alberni Engineering 93.3 The Peak pregame show is on the air at 6:45 tonight with Ace and myself, the puckdrop is at 7:00. 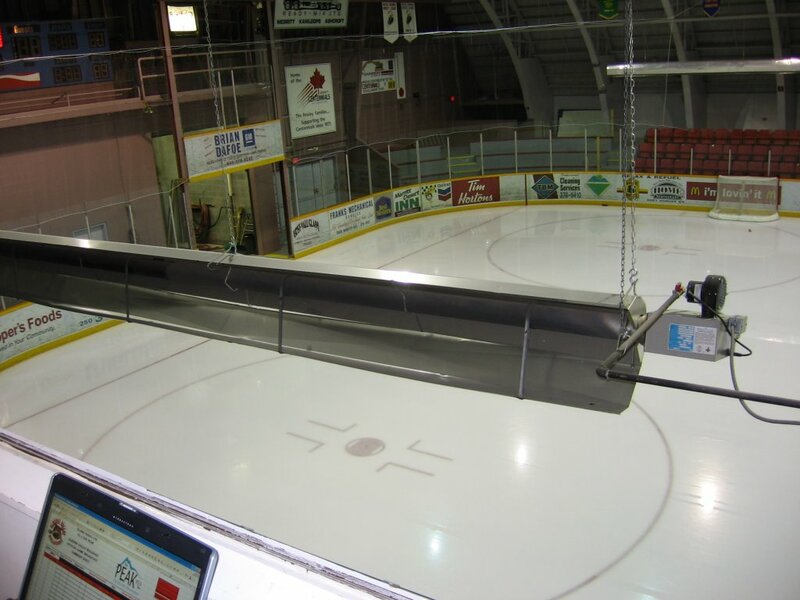 Send an email to the PRESSBOX Tonights second intermission guest is Roger Knox of the Salmon Arm Observer. We will be talking about the All Star festivities in Salmon Arm, and of course we'll set up the game tomorrow. Thanks for stopping by the blog, keep emailing your submissions, requests, ideas, complaints, pictures, etc etc, and don't hesitate to POST your comments. I'm off for my pregame nap. My thanks to Roger Knox from the Salmon Arm Observer for sending me these pictures. 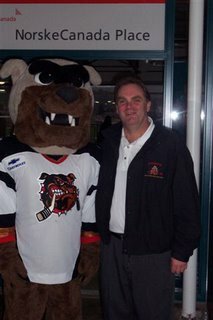 Also, my thanks to Roger for agreeing to be an interview guest on Saturday's 93.3ThePeak Bulldogs Broadcast, as the Bulldogs take on the Nanaimo Clippers. Roger and I will talk about the All star game and festivities, and of course the Bulldogs vs Silverbacks game Sunday afternoon at 3pm at the DAWG POUND. Thanks again Roger for the pictures and for the interview coming up in the second intermission Saturday night. Congrats to the coast allstars for beating the interior allstars 13-10 last night in Salmon Arm. No boxscore has been posted, but I phoned Roger Knox of the Salmon Arm Observer today and he informed me that Bert Watkins got 1 assist in the game, and Brian Stewart gave up 4 goals as the interior led 4-2 after 20 minutes. Not sure what he shots against were, but the Interior jumped out to a 1-0 lead just 8 seconds into the game, only to have the Coast fire back 7 seconds later to tie it up. Gotta love All-Star games. Great for forwards and most D men. Bad for goalies. I'm hoping Joe Scali and Andrew Estey were saving their scoring for this weekend, while the Salmon Arm and Nanaimo players got it all out of their systems in the All-Star game, haha. I'm hoping to have a picture or two to post courtesy of Roger Knox from the Salmon Arm Observer, so be sure to check back! Powell River clips, All star game and ramblings. Ace and Bernie the Bulldog. Here's the audio I chopped to podcast off the Peak's broadcast. Sorry I had to chop, I always feel bad for just getting parts, but it's always a big file with what I do get. Catch the all star game broadcast through the BCHL fanzone with John Damon play by play voice of the Silverbacks. Also on the broadcast will be Vee's play by play man Dan Marshall, and Todd Miller, voice of the Vipers. Thanks for stopping by the blog, keep sending your comments. It was a special weekend in the Valley as Bulldog fans who were there can attest to or who were there listening. It might sound hokey to say it was a special weekend for those who weren't a part of it happening. Big files so I had to chop them a bit, sorry. But still good stuff. Click to listen to part 1. Powell River game clips to come as well. Be sure to check back. Hilights on the way today! For those of you that missed the Dogs vs Williams Lake game Saturday, and the Bulldogs vs Powell River game Sunday, or for those of you that were there but want to re-live it, I'll be podcasting the hilights of those games later today, be sure to check back! First off, let me apologize for the lack of postings over the weekend. With the Bulldogs playing Saturday night, then the quick turn around to Sunday afternoon, and with the "parents weekend" events all happening I had only enough time to get one broadcast finished and get the next one ready for the next day. 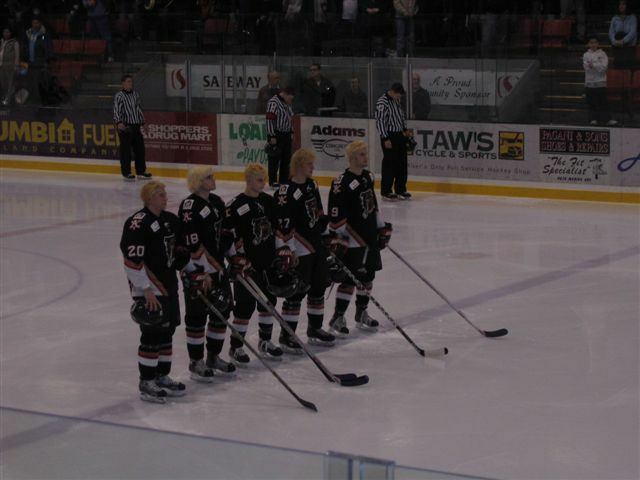 First off, Saturday vs Williams Lake. Great game for the fans, not so great for either team for obvious reasons. For the Bulldogs, obviously not good falling behind 4-0 before the game was thirteen minutes old. Great for the TWolves though, of course. Then, not great for the TWolves that they would blow that lead, and great for the Bulldogs to come back and score 3 goals in the final five minutes of the first to get back within reach. It was amazing to see the crowd rally the team after coach Hiller called the time out with the team down 4-0. It was an impromptu "standing O" that some of the crowd participated in, but it sure seemed to rally the Dogs. 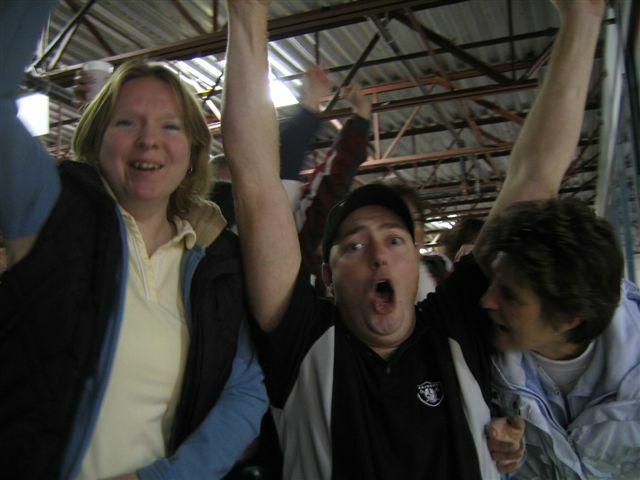 When the third goal went in, less than 20 seconds after the second goal, man was it ever LOUD in the POUND. Close to as loud as I've heard it before, and a couple people I talked to echoed that sentiments. After trailing 4-3 after one, Jordan Kremyr scored on the PP to tie it up 4-4. Less than two minutes later Devin Timberlake scored his second of the night, redirecting a point shot home on the powerplay to give the Dogs their first lead of the game, 5-4. Credit due to the TimberWolves for not quitting, and with six minutes to play in the second Drew Rose scored to tie the game 5-5. With just over three minutes to play in the second Devin Timberlake completed his hattrick with a great solo effort driving the net off the boards to put the Dogs up 6-5. In the third the TWolves would again battle back to tie the game at 6-6 with their 5th powerplay goal of the night. With the TimberWolves again on the powerplay, Tyler Ruel scored his Bulldogs-career leading 5th shorthanded goal to finally finish the games scoring with 12:29 to play. A total of 13 goals, as I said great for the fans, great for forwards I guess, but bad for goalies, defenceman, and coaches. And ACE, who had to REALLY work on his summary. A win is a win, and for the Dogs it was sweet 16 in a row. Sunday the Powell River Kings came to the DAWG POUND for an afternoon tilt. Both teams were streaking, the Bulldogs having won 16 in a row, the Kings having gone 4 and 0 in 2006. Compared to the game the night before, when it came to scoring, Sundays game was a rather tame affair. After a scoreless first period Brayden Melrose put a rebound home short of five minutes into the second to get the Dogs on the board. At the 8:54 mark of the second Aaron Schepers made it 2-0 and that would be the end of Alex Evin's day in the Kings goal. With the Bulldogs up 2-0 and on the powerplay, Ethan Cox was sent in alone on a short handed breakaway. Jim Patterson made a huge save and the games momentum swung as Stephan Pattison made it 3-0 on the powerplay moments later at the 13:07 mark. Before the second was over the Kings got on the board as Lindsay Walker scored on a breakaway to trim the lead to 3-1 Dogs after two. The only goal of the third was a hardworking effort by Evan Michalchuk to dive to a rebound and get the puck past Fleming for the 4-1 final. The game was marred by a couple of incidents and fights. Partik Bhungal was given a five minute major for charging, and Andrew Riddell a five minute major for slashing. Aaron Schepers and Tyler Boice also dropped the mitts against Vincein Scott and Michael Heck respectively. After the dust settled the Dogs had won their 17th in a row to take an 11 point lead on the Nanaimo Clippers and the Salmon Arm Silverbacks for first on the Island, and first overall. 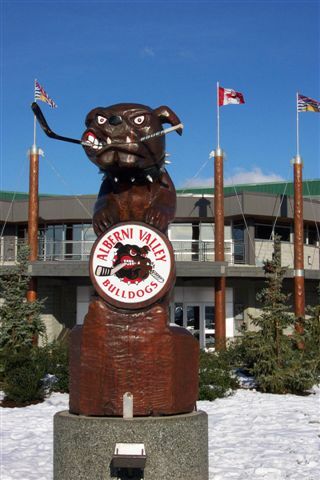 What a weekend coming up, Nanaimo Saturday night and Salmon Arm 3pm Sunday at the DAWG POUND as the Bulldogs wrap up their eight game home stand. It could be interesting when the National rankings come out tomorrow. Will the Bulldogs, winners of 17 straight remain in second or move up to first in the nation? Last weeks #1 team did not have a perfect weekend. If there's any justice, the Bulldogs in a much deeper league will take #1, but as we've seen a couple times this season the rankings aren't always JUST at least by MY and OUR opinion in Bulldog land and in the BCHL. First off- the reason for the picture. I sent out the word to anyone who was still in touch with former Bulldogs to give me their contact info, as per fan requests I wanted to set up some "alumni" interviews for our Bulldogs broadcasts. Les Dorion talked to former Bulldog captain Colin Guiguet over Christmas, and sent me his info so I could get a hold of him. The interview with Colin will run during the second intermission of tomorrow's game against Powell River. I just wanted to post a day early to give fans of Colin a heads up to catch the interview. My thanks again to the BIG DOG for setting it all up. 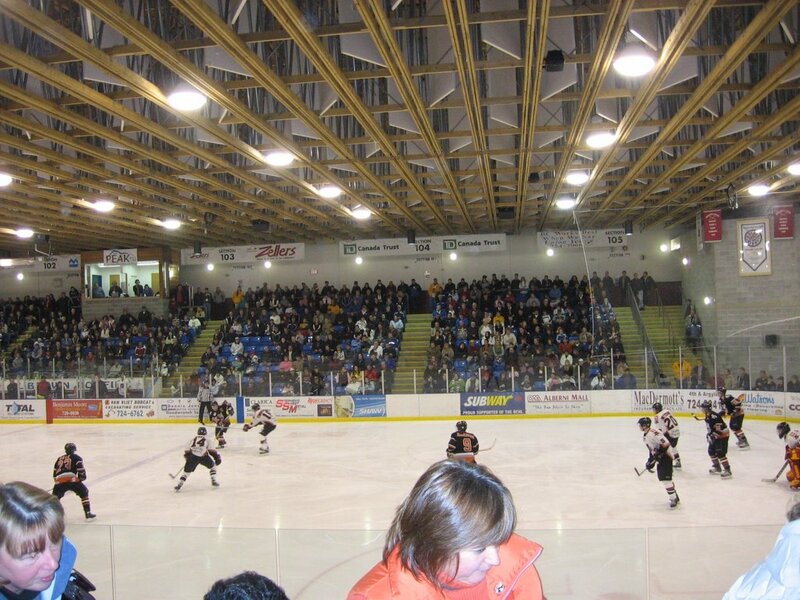 The Bulldogs play game #5 of their 8 game home stand tonight as they host the Williams Lake TimberWolves. With the Nanaimo Clipper loss to the Cowichan Valley Capitals 5-4 last night, the Bulldogs lead the Island Division and the BCHL overall by nine points. 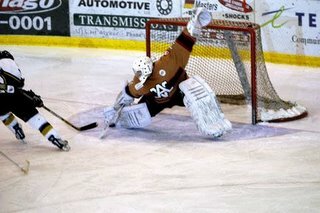 Williams Lake lost 4-3 in double OT in Powell River last night, as former Bulldog Andrew Riddell scored the winner. The TWolves are four points out of a playoff spot, and have earned at least a point in their last 6 games. When these two teams meet, in the "battle of the dogs" as Ace calls it, it's always interesting hockey. I'm not sure what the head to head records are of the teams, but Ace does and he will no doubt mention them tonight. Time for a flashback from the only meeting of these teams so far this season. CLICK TO LISTEN to the game winner October 15th in Williams Lake. 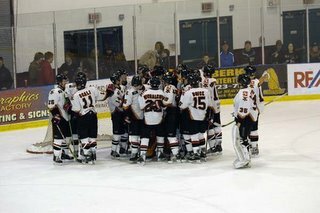 Catch the Alberni Engineering pregame show on 93.3 The Peak FM at 6:45 tonight with Ace and myself live from the DAWG POUND. If you're out of The Peak's listening area, catch the internet broadcast through the BCHL's Fanzone. As always I welcome your postgame comments here on the blog, and your requests, complaints, suggestions, pictures and more. 15 in a row for the Dogs. The Bulldogs beat the Burnaby Express last night 4-1, for their 15th straight win half way through their eight game home stand. 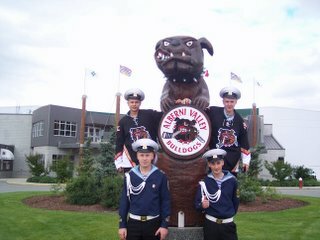 Bulldog goal scorers were Jordan Kremyr, Maury Edwards, Tyler Ruel, and Brayden Melrose. Edwards goal was on the powerplay, while Ruels was a short handed effort pulling him infront of Joe Scali and Jordan Kremyr for the career short handed goal title with 4. The Bulldogs have Friday off and take on Williams Lake Saturday in "the battle of the dogs" as Ace calls it, before hosting Powell River Sunday afternoon to round out the weekend. It's game day once again, and it's parents weekend, as the Bulldogs take back to the Dawg Pound ice at the mid point- game 4, of their 8 game home stand. Coming off the 4-2 win over the Hornets, the Dogs have won all four games of the homestand, and they've also won 14 overall in a row to boot. Bulldogs coach Jim Hiller mentioned on our Peak Postgame show Saturday night that there may be a couple of injured players returning for tonights game. Getting any combination of Joe Scali, Brayden Melrose, and Issac Smeltzer back into the line up is an exciting thought for Bulldog fans no doubt. The Burnaby Express are on game two of a four game Island swing tonight, after falling behind 2-0 just ten minutes in on the way to losing 3-1 to the Clippers at Frank Crane last night. 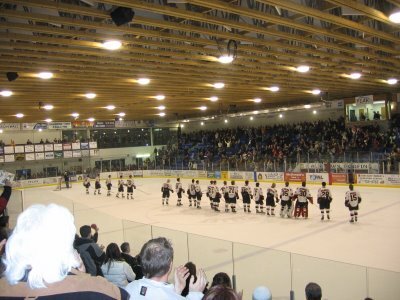 This is the final regular season meeting of the teams, after the Bulldogs won the previous encounter September 25th, 4-1 at the Bill Copeland Arena in Burnaby. It was certainly a gutsy effort from the Dogs, having travelled all morning taking two ferries down the sunshine coast from Powell River the night before to make the afternoon start time. It was a much different Burnaby Express team than the one they have now, as the Bulldogs won 4-1. The Peak pregame show is live on 93.3 The Peak FM with Ace and myself at 6:45 tonight, the puck drop live from the DAWG POUND is 7:00. Tonight's second intermission "feature interview" guest is Brad Lawyrk from the Williams Lake TimberWolves to set up the TWolves visit to the Multiplex Saturday night. Thanks for stopping by the blog, keep sending comments, requests, questions, complaints, and the like! Greetings everyone. The deadline has passed with one of the more quiet deadline days in recent memory. Albeit the night wasn't without it's confusion that's well known. The Bulldogs chose to stay with the team that so far has them first overall and second in the nation. Todays blog posting is the first one that was requested. I got the requesters permission to post this e-mail. Your blog looks good. We missed part of your Saturday night broadcast - tuned in to Matt's game for awhile. When we talked to Bert on Sunday, he said he had been interviewed after the game. We also missed his goal. Since he doesn't score very often we wondered if we could get you to post the call of his goal as well as his interview. If it is too much trouble. I'll be out to the "Parents' Week-end" see you then. Without Further ado, heres the audio. Thanks again for stopping by the blog. Game thoughts coming on game day tomorrow. Audio post: Tuesday, Jan 10th. Hello fans, and thanks for stopping by the blog. Greetings everyone, and once again thanks for stopping by. Today instead of typing in my ramblings, I'm adding an audio post. Keep posting your comments, and keep emailing your hilgiht requests, complaints, concerns, ideas, picture submissions, etc. 14 in a row for the Bulldogs. A 4-2 victory tonight for the Dogs over the Langley Hornets. The Bulldogs led 3-0 after one, and 4-1 after two. Credit due to the Hornets for not quitting, and winning the third period. It could've been a different game if Ryan Riddle had started the game in the Langley net. Those that saw Ryan Riddle with the Salsa last year know of his ability to keep a team in the game. Not blaming Stepen Caple, the starting Langley goaltender tonight, as he wasn't to blame. Next Bulldogs action is Thursday against Burnaby to kick off the Bulldogs "parents weekend" after the trade deadline. Bulldogs fans, kick it up a notch to show the parents that haven't been to the pound yet what a great place it is to watch a hockey game, and what a great place it is for their boys to play. 14 in a row, holy smokes. With the Clippers 7-2 drubbing in Powell River to the improved Kings, the Bulldogs have a nine point lead for first overall, and first in the Island. Bernie when he used to see more sun. The Bulldogs play game 3 of an 8 game homestand after winning lucky 13 in a row last night 2-1 over the Victoria Salsa. 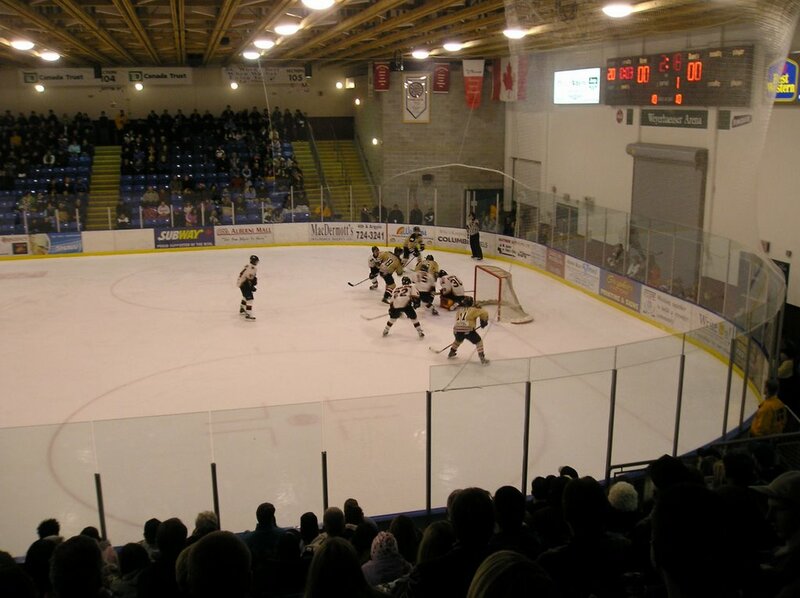 The Langley Hornets won their second in a row to start 2006, 3-2 over the Capitals last night in Duncan. Langley has 4 wins and 1 OT loss in their last five contests. The Peak pregame show is live on 93.3 The Peak FM with Ace and myself at 6:45 tonight, the puck drop live from the DAWG POUND is 7:00. 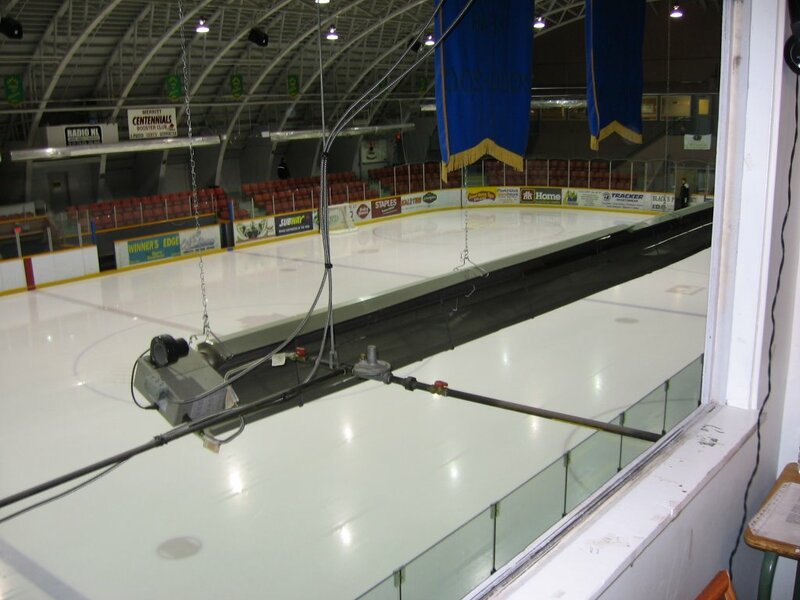 Tonight's second intermission "feature interview" guest is Team1040 on air host, and Burnaby Express play-by-play man Eddie Gregory to set up the Express visit to the Multiplex this coming Thursday. First off, my thanks to the "BIG DOG" Les Dorion for the photo you see above. Les has jumped on board in supporting this, like he supports everything else, and he's already sent me a good collection of pictures to share with everyone on this blog. I'm not sure if photo credit goes to Les for this picture, all I know is that he sent it to me. I'm guessing it's his shot though. If I'm not mistaken, that is a picture of the pregame ceremonies before the first Bulldogs game at the DAWG POUND back in September of 2002. Hopefully someone will add a comment and correct me if I'm wrong on that one. The Bulldogs go for lucky number 13 in a row tonight as they look to build on their franchise record winning streak. Tonight's game is game number two of an eight game home stand for the Dogs. There will surely be some cheers for former Bulldog Jordan Macintyre, now suited up in the #6 sweater for the Salsa. Numbers- The Bulldogs have won six straight head to head match-ups this season vs Victoria for a 6-1 record, after losing the first head to head contest at The Save on Foods Memorial Centre on September 10th. The Bulldogs have outscored the Salsa 20 to 2 in the three games this season in the pound. The Peak pregame show is live on 93.3 The Peak FM with Ace and myself at 6:45 tonight, the puck drop live from the DAWG POUND is 7:00. Our "feature interview" tonight in the second intermission show is our good friend "JB" from the Chilliwack Chiefs; as he'll give us a heads up on the mainland division with the Langley Hornets visiting the Bulldogs tomorrow, and the Burnaby Express at the pound next Thursday. I will be adding some post game comments tonight, I hope that you will stop by and do so as well. See you at the rink, and GO DOGS GO. 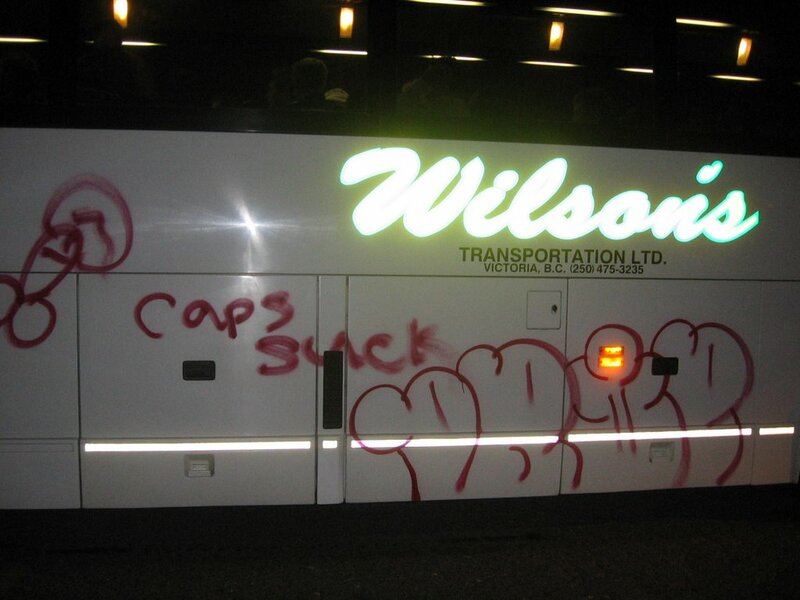 Yes, I know this blog is supposed to be about the Bulldogs and BCHL mostly. How could I not say something about team Canada? Repeating with no returning players (ok I will HALF count Cam Barker) is quite a feat. As good as Staal was on defense and as deserving as he was of the best D-man award, I thought Luc Bourdon was better. I'm also guessing that the "goaltender of the tournament" award was picked before today's gold medal game. Nothing against the Finnish netminder Rask as they weren't even to the semis if it wasn't for his masterful performance against Sweden. Pogge may have his defensively sound team infront of him to blame for the fact he didn't win the best goaltender award, as he wasn't tested enough. Today when it really counted he was more than tested, and he more than passed the test. Yes those of you that know me will say "leave it to Hammer- a goalie, to talk this much about a goalie" but come on people he set a World Junior Record, and he was the MVP today. GO CANADA GO. Enough of the non-Bulldog and non-BCHL posts, I promise. Greetings. It's a big day today. Big for a couple of reasons. 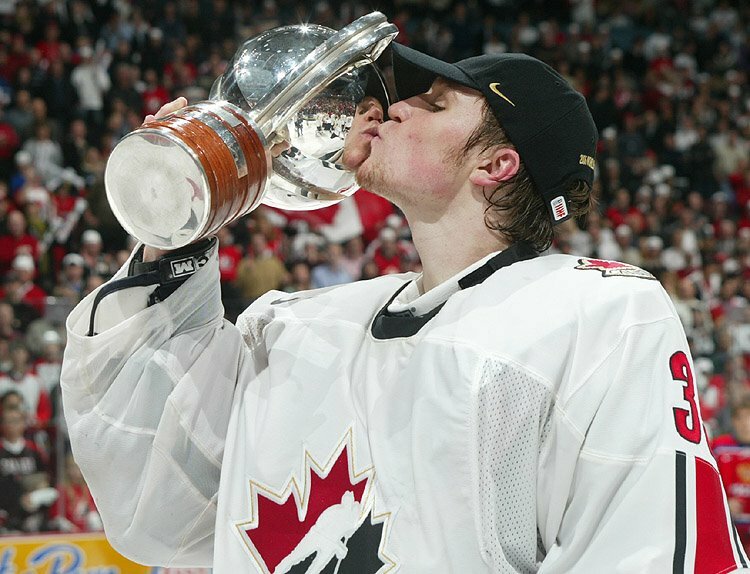 Big for the fact that Canada takes on Russia today for the gold. Big for the fact that after today, it's Bulldogs game day. Finally, today is big because it dawned on me that I better start spreading the word about this blog, because right now I'm just writing and posting on this to read my own postings. As soon as I'm done work today, I'm going to e-mail the address for this blog to everyone in my address book that I think might care ONE IOTA about Bulldogs hockey and the like. I hope you will do the same as I did. The whole reason I created this was not to detail my life or chit chat about life's musings. The title says it's all- Hammers Bulldog Blog. I'm looking forward to giving the online Bulldog fan/parent/girlfriend/family member etc a place to read up a little on the team, and most importantly a place to be able to listen to the hilights of the Bulldogs broadcasts. Unfortunately the BCHL fanzone doesn't archive all of the broadcasts the way our radio station did last year, so this will have to do! I know it's only a small bit a piece here and there, but it's better than nothing I hope. I want your feedback, and I want your comments. Email me, and add comments to my posts. I'm a rookie 4th line blogger, that's for sure, but I'm going to try my best! Canada vs Russia today at the WJHC for the gold medal. Should be a beauty. I'll be deeply rooted on the couch in front of the TV for this one. Wish I could be there live to see it, but I'm without tickets. 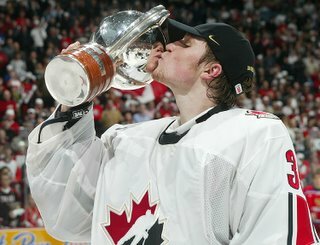 When the US and Russia were playing in the semi final for the right to take on Canada in the final, it was my gut feeling that Russia would be a much tougher challenge for Canada than the US. As much as I would've enjoyed Canada playing, and hopefully beating the US again, the Russians were much to strong. Now I hope our boys can find another way to win just ONE more, against a really good team. The 8-1 drubbing Canada handed Russia in the pre tournament games means ZERO today. One more day until it's Bulldogs game day again. Bulldogs take on the Victoria Salsa tomorrow at The DAWG Pound. The Bulldogs are on a franchise record 12 game winning streak, but aren't playing their best hockey, and aren't playing prototypical "Bulldogs" hockey at the moment. Bulldogs Coach Jim Hiller stated basically that on our 93.3ThePeak Bulldogs Broadcast last Saturday on the post game show, after The Dogs beat The Powell River Kings 3-2. The Bulldogs are 6 and 1 against the Salsa this season, winning 6 straight. 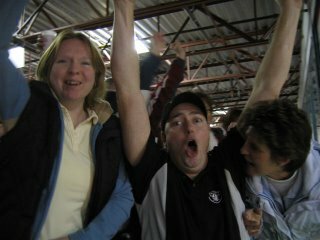 The only Salsa win over the 'Dawgs was a 3-1 win at The Save on Foods Memorial Centre in Victoria, game number TWO of the season wayyyyy back in early September. HOWEVER, the Bulldogs wins against the Peppers haven't come easy. The three Bulldogs wins in Victoria this season have been by a grand total of three goals. Two of those games also went to overtime. Click to listen to the highlight of the most recent OT win for the Dogs over the Salsa, December 16th at the Bear Mountain Arena. If there's one thing that's certain, it's that the Salsa have struggled in the Dog Pound this season. I'm pretty sure they struggled in Alberni last year too, but that's some numbers I'll have to see if "The Ace" can shed some light on. What I do know, is that the Dogs are 3 and 0 against the Salsa on home ice, and the have also outscored the Salsa an amazing 20 to 2 in those three games. As I've always said, the past means nothing. The Bulldogs will have to be ready to go tomorrow. In closing- you may be wondering why The Bulldogs vs Salsa highlight is titled "the thump". The only reason you wouldn't be wondering why it's called that, would be because you got an email from me telling the story and sharing the highlight. Well, the story behind "the thump" is one I will save for tomorrow. I must give anyone reading this blog at least and EXCUSE to come back and read again! Post#2 Off to the hilights! Alright, here's my shot at my second post. Trust me, before long, I hope to get smart enough at doing this that I don't have to say "here's my shot at...." I'm working on it! NOW- I'm trying to make the step up to adding HILIGHTS which is why this blog was started in the first place. Click the link below for a hilight reel I through together for the Bulldogs players, at their request. 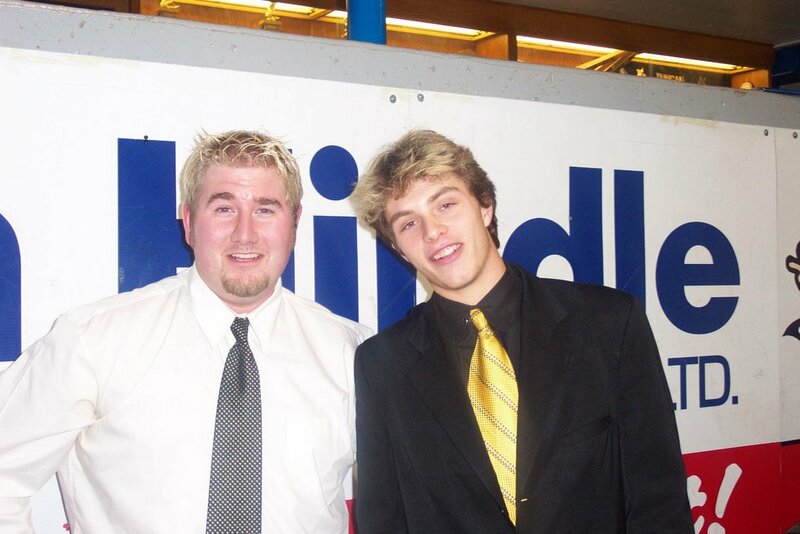 I tried to start a blog early in the 2005-2006 BCHL season but got quickly frustrated and gave up. Please wish me luck, on attempt #2.